A facelift is a surgical method that removes excess facial skin to make the face appear younger. During a face-lift, facial soft tissues are lifted, excess skin is removed and skin is draped back over the newly repositioned contours. Cosmeticium is one of the main clinics who offer facelift surgery in İstanbul, Turkey. The doctor will also examine your facial structure, including skin texture, color and elasticity and the underlying bone, discuss how your face can be changed, explain the details of the procedure, and develop a plan for surgery and healing with you. You may not take aspirin or any non-steroidal, anti-inflammatory medicine (such as Advil or Motrin; Tylenol is acceptable) for about two weeks before and after the surgery. You must stop smoking for several weeks before and after the surgery because smoking can interfere with healing. A traditional facelift procedure is performed through an incision starting in the hair or hairline above and in front of the ear (the temporal region). The incision is extended downward in front of the ear, comes under the ear and then upward behind the ear ending in the hair or hairline behind the ear. The skin and fatty tissues are then lifted off the underlying muscle and fascia (connective tissue) as far forward as is necessary to correct the loose skin problem. The underlying muscle and fascia can be tightened with sutures if the surgeon feels it is necessary. The skin is pulled back and upward and the excess skin removed. The wound is then closed with sutures and skin staples. Some surgeons leave a drain in the wounds to remove excess blood. Bandages are then applied. There are surgical techniques which go into deeper tissues rather than under the skin and fat. It is normal to have some bruising and swelling after the surgery. The majority of your bruising and puffiness should be gone after 2 to 3 weeks. Bear in mind that people heal at different rates. Stitches are typically removed within 5 days, and patients can often return to work after about 2 weeks. Swelling and bruising may persist for several weeks, but should be less noticeable as time passes. 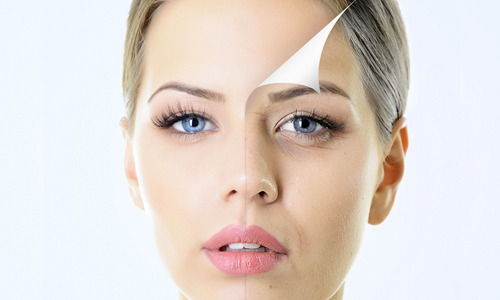 Recovery after a facelift can be a slow process and cannot be rushed. Residual swelling will fade slowly over time, and final results should be apparent at about 6 months following surgery. While the aging process will always take it’s course, patients who are 5 to 10 years out for their facelift still can have outstanding results. And even for decades afterwards they can be much improved in their appearance. Facelift, or rhytidectomy, is a surgical procedure to improve visible signs of aging on the face and neck. As individuals age, the skin and muscles of the face region begin to lose tone. The facelift cannot stop the process of aging. It can improve the most visible signs of aging by tightening deeper structures, redraping the skin of face and neck, and removing selected areas of fat. A facelift can be performed alone, or in conjunction with other procedures, such as a brow lift, liposuction, eyelid surgery, or nasal surgery. What type of anesthesia will I receive for my Facelift? Facelifts are usually performed with general anesthesia. For a traditional facelift, an incision is made behind and slightly in front of ears and the skin of the face is lifted from the underlying tissues and muscle. The facial skin is then tightened and the excess removed before the incisions are closed. A bandage will be applied to the face at the completion of surgery. Surgery is usually preformed as an outpatient or overnight stay and usually takes about two to three hours. You may experience some temporary discomfort, particularly around the incisions, but this can be relieved with prescription medication. What should I expect of the recovery after my Facelift? You can expect some bruising and swelling after your facelift. Most of the swelling should fade within about a week, while the bruising may take two to three weeks to clear up. You may experience some headaches and numbness, itching and hair loss at the incision. Bandages applied after surgery are usually removed within a couple of days, and stitches may be removed within one to two weeks. Most patients can return to work in about two to three weeks after a facelift procedure is done and one to two weeks after a mini facelift. Regular activity depends on the activity itself and the patient. Physical exercise or any other activity that will raise the blood pressure should be avoided for about three weeks. How much time should I plan to take off from work after my Facelift? Normal activities, including work, can usually be resumed within 2 weeks. What are the risks and complications involved with having a Facelift? As with any surgery, there are risks involved. Smokers are required to refrain from smoking, before and after the procedure, for a minimum two months, to reduce the likelihood of complications. Some possible risks are hair loss, nerve damage and delayed wound healing. As with all facelifts and other cosmetic surgeries, the longevity of the benefits is dependent on several factors. The “deep plane” achieves results that you can expect to last up to 12 years, or even longer with a healthy lifestyle and customized skincare regimen. A mini facelift, although is less invasive, typically only lasts a couple of years at most.